A confession: I am nursing an instinctive, visceral dislike of Keep Calm and Carry On posters and merchandise. It contains some of the things I like least – the smug nationalism, the invocation of “our finest hour” of WWII, the assertion that “keeping calm” is a morally superior reaction and that there is no point in getting angry. The image it summons is one of plucky Brits doing their best to carry on as normal among the bombs and the rubble. That war merely gives British resilience and stoicism to shine through, rather than being devastating. I cannot help but notice that this poster has flourished in these days of the coalition government. When courts are being kept open 24 hours a day to deal with those involved with riots, but the Prime Minister can be involved with phone hacking and no one seems to question his suitability as PM. When ATOS mounts legal threats against online patient groups and forums. When our centres of higher education are being marketised. When councils are trying to evict tenants whose children may have been involved in rioting and a government petition for stopping their benefits reaches the crucial 100,000 signatures, as if homelessness and poverty is not going to cause even more problems. Where schemes to support children and young people are cut out of existence. When the NHS is being dismantled in front of our eyes. 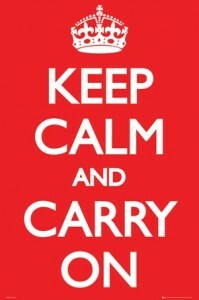 In whose interests is it that we “keep calm and carry on”? That we don’t question, don’t think, don’t disagree or protest but simply trundle on? I don’t think it’s in mine, and it’s probably not in yours. Instead, I prefer the suggestion offered by this poster. Get Angry and Fight Back? I think I can support that.